One of the hardest things to do in life is to remain quiet while listening to people talk about things of which they have no concept. After several days of biting my tongue, I’ve lost the battle. The negativity aimed at Lebron James, and anyone associated with his decision, has been ridiculous. It’s a sad testament of the current state of American Society. It’s a reminder that the freedom of speech associated with democracy also allows for the flourishing of hipocrisy. I don’t know where to begin, but let’s start with a teenager’s rise to fame, from the slums of Akron. Lebron James was crowned king by adults, who somehow benefited from his basketball talents (whether it was financial or otherwise). He was put on the cover of Sports Illustrated by adults. He was followed around with a video camera, documenting his every move, by adults. He didn’t apply to be a cast member of the Real World, but his real world became our Real World courtesy of….you guessed it, adults. It’s almost comical how those adults have all of a sudden fell victim to the reverse Benjamin Button affliction, acting more like children the older they get. In a time when #1 draft picks become busts and get busted for banned substances, or become married to the fast life while leaving their first marriage (and family) behind, I wouldn’t have been surprised if Lebron’s closet had been pried open, revealing more skeletons than CSI (all 26 different cities that are on the air now). Instead, Lebron has been a stand-up guy, trying to be the best man he can without getting burned by the constant glare of the spotlight. He’s been a father to his kids, an ambassador for the organization that employed him and a positive role model for kids. All the while, he’s carried himself with a class and maturity that people twice his age don’t possess. Nevertheless, the same society that cheers for convicted felons (some repeat offenders) has ridiculously turned Lebron into the example of what’s wrong with sports. The same people, that say his handling of his decision was self-centered, anxiously awaited any gossip of where he might end up and tuned in to watch his announcement live. The fact that his decision gained more viewers than the 2007 finals, in which his team played, only proves, to those who say “he made his self bigger than the game”, that in fact they are the ones who cast his shadow larger than the league’s. The notion that Lebron owed it to the city of Cleveland to stay, is ridiculous! He has already made the city of Cleveland more money than anybody in it’s history. Did Magic Johnson owe it to East Lansing to sign with the Pistons as a free agent? Did Larry Bird owe it to French Lick to sign with the Pacers? Even though they never played for the team, or boosted the struggling economy, in their home state they are still welcomed with open arms. If Akron loved Lebron like they claim they did he should always be king in his hometown. Lebron, and anyone else regardless of occupation, owes it to himself to do what he thinks is best for him and his family. Please don’t bring up loyalty when it comes to sports and entertainment. Jay-Z (who Lebron also shun) said it best, “The same sword they knight you, they gone goodnight you with”. American society builds people up, only to tear them down. We wait for them to do something wrong and we release the hounds. When there isn’t a scent for the dogs to pick up, like in Lebron’s case, we create a smell. We go from complaining about money hungry athletes who don’t care about winning, to crucifying a man for raising 2.5 million dollars for charity and walking away from 15 million dollars towards a situation where he thinks he can win a championship. We start by bashing athletes for being egotistical enough to think they can do it by themselves but finish by questioning their character for joining with other great players. We measure a players greatness by how many championships he’s won only to tell him where and how he should win those rings. 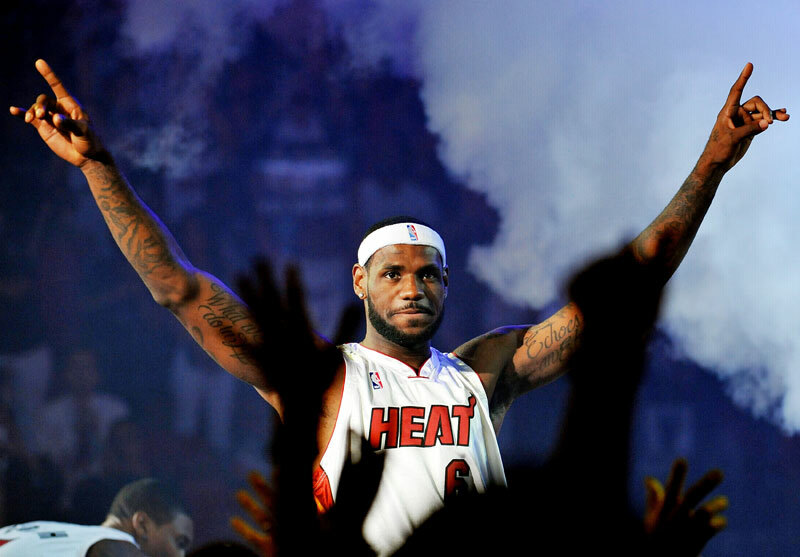 I have even more respect for Lebron for making the right decision, for him, regardless of what anyone else thinks. I’m not here to argue that he made the right decision, I’m here to support his right to make the decision. I’m also here to ask society to do something Lebron had the courage to do…make up your mind. Decide what you stand for and hold on to it no matter what. Remember that we, as adults, have a responsibility to empower the next generation. What’s funny is that Lebron showed us what he was going to do long before his decision. 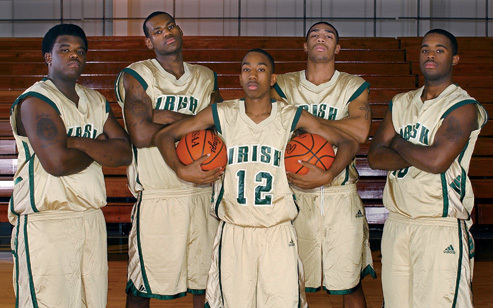 If you refer back to the documentary of Lebron’s high school team (which made someone a lot of money in the theaters and on MTV and BET in recent weeks) you can see a kid who was happy playing a game with his boys. I know it’s difficult for all you sophisticated adults to comprehend, but Lebron simply made a decision to be happy again, playing a game with his boys. No problem with the decision made by the player but the way it was handled by his team was atrocious. A minor thing in the grand scheme of things and he has the right to be wherever he wants to be and he certainly sacrificed to do so. This is rational and on point, so I’m not surprised I haven’t heard these same points made elsewhere. You are the first to point out that he did exactly the same thing as a kid in middle school choosing to play with his “family.” He repeatedly pointed that out in his Miami Heat press conference. I really forget that he is only 25 and is so composed. He is one of the last sports figures I can believe in. Thank you kind sir for pointing this out, said almost the exact same thing in my article! Keep up the good writing and good luck this season!